Premium Grade sensi Formulation TM Tommy 2Part A&B GROW. Tommy 2Part A&B GROW is a pure mineral formula for all leading substrates, systems, water and plants. The NPK ratio within Tommy 2Part A&B GROW has been developed, tested and used by UK professional growers on the plants you love before its final release for use within the UK hydroponics marketplace. Tommy 2Part A&B GROW mixes clear and clean in the reservoir with a stable pH. The Tommy 2Part A&B GROW formula contains a full profile of plant available minerals. Tommy 2Part A&B GROW is our preferred base nutrient for use from seedling or clone to pre flowering your favourite plants. Tommy 2Part A&B GROW will ensure your plants are receiving the correct NPK ratios at the right time to maximise returns on high value heavy yielding colourful aromatic consumer crops, competition ornamental & medicinal plants. We can guarantee that the nutrient ratio in our Tommy 2Part A&B GROW, Tommy 2Part A&B BLOOM and Tommy 2Part A&B COCO base nutrients, including all of our PK boosters and additives have and will be continually upgraded and used by us until we feel 100% happy with the final produce from the plant including: aesthetics, aroma, taste and affect, we are already working on the Tommy Gun Nutrients 2Part A&B MK2 formula! Colourful aromatic competition ornamental and medical plant strains can greatly benefit from product Tommy TERPENE+ as it will increase carbohydrate availability resulting in accelerated uptake of vital minerals including P&K while providing a valuable food source for the beneficial microbe life within your chosen substrate. Tommy TERPENE+ can increase resin production within resinous ornamental and medicinal plant types without adding NPK or interfering with existing nutrient programs, leaving you free to use it at any time you feel the plant may need it. Suitable for all leading substrates, systems, plants and water. 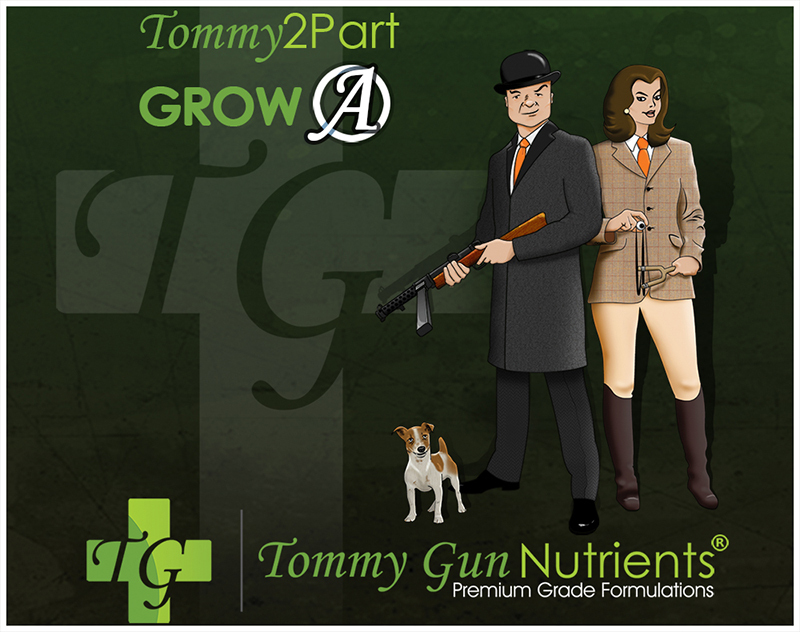 Tommy Gun Nutrients 2Part A&B GROW preflowering nutrient ratio. Suitable for dwarf & sensitive plants. Increases the terpenes linalool and pinene. UK Premium Grade sensi Formulation. Designed especially for heavy yielding colourful aromatic consumer crops, competition ornamental & all types of UK medicinal plants. DILUTION: 1 - 4 ml per litre. Pour Tommy A into the reservoir and stir well before adding Tommy B.
Stir again and then leave for some hours before use. USE on any leading substrate, system or water. ​Adjust pH to between 5.5-6.2 in Hydroponics or Coco Coir. For best results use Gun DOWN ACID pH water conditioner. Premium Grade sensi Formulation Tommy 2Part A&B GROW. CAUTION: please follow instructions carefully. When not in use store safely in a dark place. Wear Personal Protective Equipment (PPE) when handling. Tommy 2Part A&B BLOOM is a premium mineral formula for all leading substrates, systems, water and plants. The NPK ratio within Tommy 2Part A&B BLOOM has been developed, tested and used by UK professional growers on the plants you love before its final release for use within the UK hobby hydroponics market place. Tommy 2Part A&B BLOOM mixes clean and clear in the reservoir with a stable pH. The Tommy Gun Tommy 2Part A&B BLOOM formula contains a full profile of available minerals. Tommy 2Part A&B BLOOM is our prefered base nutrient for use during the flowering, fruiting stages of a plants life. Tommy 2Part A&B BLOOM will ensure your plants are receiving the correct NPK ratios at the right time to maximise returns on high value heavy yielding consumer crops and competition ornamental plants. We can guarantee that the nutrient ratio in our Tommy 2Part A&B GROW, Tommy 2Part A&B BLOOM andTommy 2Part A&B COCO base nutrients, including all of our PK boosters and additives have and will be continually upgraded and used by us until we feel 100% happy with the final produce from the plant including: aesthetics, aroma, taste and affect,,,, we are already working on the Tommy Gun 2Part A&B MK2 formula! With the correct and timed application of Tommy Gun Nutrients GUNPOWDER PK, GUNPOWDER PK Liquid & Combat JUICE PK massive yields may be achieved, maximising your return on high yielding crops while increasing aesthetics, terpene aroma and market value. Colourful aromatic competition ornamental and medical plant strains can greatly benefit from product Tommy TERPENE+ as it will increase carbohydrate availability resulting in accelerated uptake of vital minerals including P&K while providing a valuable food source for the beneficial microbe life within your chosen substrate. Tommy TERPENE+ can increase resin production within resinous ornamental and medicinal plant types without adding large amounts of NPK or interfering with existing nutrient programs, leaving you free to use it at any time the plant may need it. Tommy Gun Nutrients 2Part A&B BLOOM nutrient ratio. Suitable for all leading substrates, systems and water. Increases terpenes linalool and pinene. ​USE on any leading substrate, system or water. Adjust pH to between 5.5-6.2 in Hydroponics or Coco Coir. 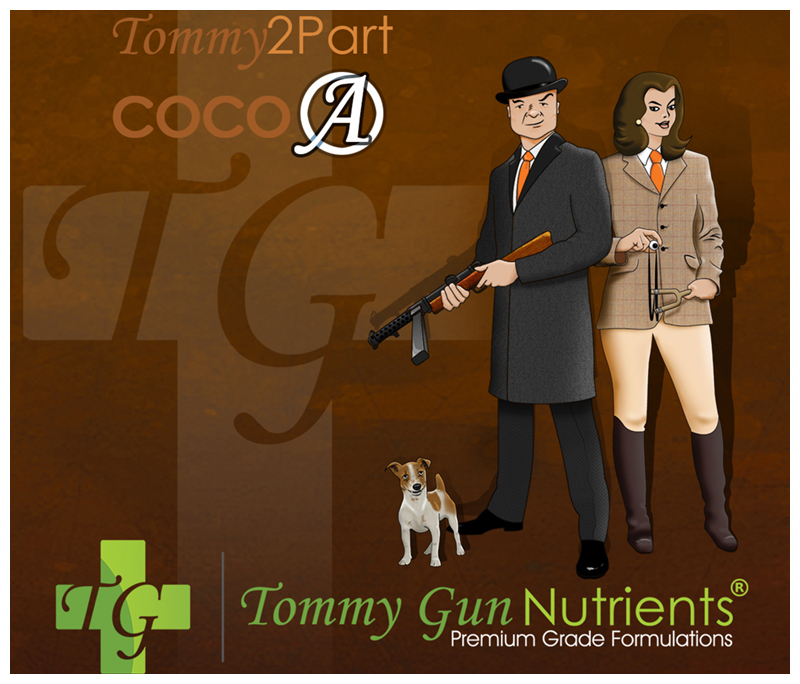 Tommy 2Part A&B COCO formula contains a full profile of available minerals and has a stable pH. Tommy 2Part A&B COCO is our preferred nutrient for use on coco coir and coco chip based substrates during the vegetative, pre flowering and flowering, fruiting stages of a plants life. Tommy 2Part A&B COCO will ensure your plants are receiving the correct NPK ratios at the right time to maximise returns on high value heavy yielding colourful aromatic consumer crops and competition ornamental plants growing in coco based substrates. We can guarantee that the nutrient ratio in our Tommy 2Part A&B GROW, Tommy 2Part A&B BLOOM and Tommy 2Part A&B COCO base nutrients, including all of our PK boosters and additives have and will be continually upgraded and used by us until we feel 100% happy with the final produce from the plant including: aesthetics, aroma, taste and affect, we are already working on the Tommy Gun Nutrients 2Part A&B MK2 formula!! ​With the correct and timed application of Tommy Gun Nutrients PK boosters such as GUNPOWDER PK, GUNPOWDER PK Liquid and Combat JUICE PK massive yields may be achieved maximising your return on high yielding crops while increasing aesthetics, aroma and market value. Colourful aromatic and medical plant strains can greatly benifit from Tommy TERPENE+ as it will increase carbohydrate availability resulting in accelerated uptake of vital minerals including P&K while providing a valuable food source for the beneficial microbe life within your chosen substrate. Tommy TERPENE+ can increase resin production within resinous ornamental and medicinal plant types without adding large amounts of NPK or interfering with existing nutrient programs, leaving you free to use it at any time the plant may need it. Add Tommy A to the reservoir, stir well then add Tommy B.
Stir again then allow to stand for some hours. USE on any leading COCO based substrate or system. ​GUNPOWDER PK is a Premium Grade Formulations Wettable Powder flower booster designed for use in the early and later stages of the plants flowering cycle to increase flower and bud size, while enhancing aroma, taste, aesthetics and overall plant size in heavy yielding consumer crops and ornamental competition plants. GUNPOWDER PK is a very cost effective way of PK boosting your nutrient base during times of need. Growers are now reporting the same amazing results that we have been used to, by using GUNPOWDER PK. We call it "A Tommy Gun ATTACK". AVAILABLE SIZES: 65g WP foil pouch. With the correct and timed application of PK boosters such as GUNPOWDER PK, GUNPOWDER PK Liquid & Combat JUICE PK in combination with our base nutrients, massive yields may be achieved, maximising your return on high yielding crops while increasing aesthetics, terpene aroma and market value. ​product: Tommy TERPENE+ as it will increase carbohydrate availability resulting in accelerated uptake of vital minerals including P&K while providing a valuable food source for the beneficial microbe life within your chosen substrate. Tommy TERPENE+ can increase resin production within resinous ornamental and medicinal plant types without adding large amounts of NPK or interfering with existing nutrient programs, leaving you free to use it at any time the plant may need it. 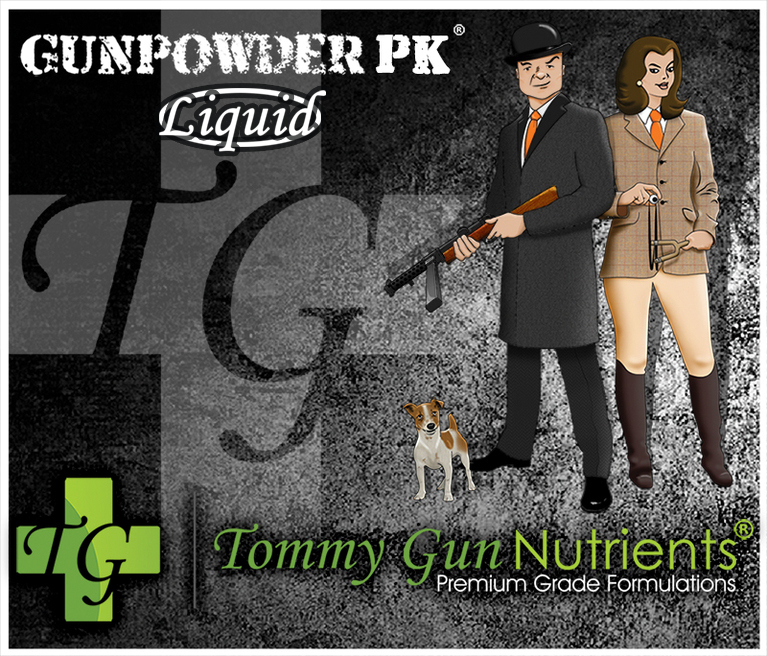 GUNPOWDER PK wp can be used on any and all leading substrates, systems or water, but for consistently outstanding results use with only Tommy Gun base nutrients and additives. Use GUNPOWDER PK wp during the first week of bloom and or the last 3 weeks before harvest. GUNPOWDER PK can increase the size, weight, resin production and ultimately the taste of your fruits dramatically. Adjust the base water pH with Gun DOWN ACID pH water conditioner, Reduce your base nutrient of choice to an EC of 1.2 ( or half strength ) then add GUNPOWDER PK wp. Only use GUNPOWDER PK wp when your plants are in peak condition. GUNPOWDER PK wp can be used as a stand alone booster or with base nutrients. Week 1 Bloom Phase: 0.16g per litre nutrient solution (Can be used with GROW A&B). Week 6 Bloom Phase: 0.16g per litre of nutrient solution. Week 7 Bloom Phase: 0.325g per liter of nutrient solution. Week 8 Bloom Phase: 0.65g per litre of nutrient solution. ​EXPLOSIVE DOSE: Bring forward week 7. STAND BACK & WATCH YOUR FLOWERS BOOM!!. GUNPOWDER PK Liquid is not just a Phosphorus and Potassium concentrated liquid, it is a Premium Grade sensi Formulation TM PK Booster and contains other elements such as Sulphur, Bio Stimulants and Amino Acids. All very important in maintaining plant health, vigor and enhancing yield, aroma, colour and flavours from your favourite fruits and flowers. Premium Grade Formulations TM Bio-stimulants will greatly affect Cation Exchange Capacity (CEC) within the rhizophere when growing in all leading substrates systems and water types. This is why we include them in this stand alone fruit and flower enhancer we call GUNPOWDER PK Liquid. Bio-stimulants will also enhance root growth and make elements more available for your plant. Premium Grade Formulations TM Amino Acids are the building blocks for this very special flower boosting product. By adding our own secret blend at precisely the right time to the corresponding plant strains we can start to ensure that the fruits develop the kind of structure, flavour, aroma and brix production that we prefer to see in our own plants. Premium Grade Formulations TM Sulphur will see that the uptake of Phosphorus is greatly increased. The concentration will speed up Photosynthesis, sugar production, growth, higher yields and in the building of proteins and Amino Acids. With the correct and timed application of PK boosters such as GUNPOWDER PK & Combat JUICE PK TM massive yields may be achieved, maximising your return on high yielding crops while increasing aesthetics, terpene aroma and market value. ​Colourful aromatic ornamental and medical plant strains can greatly benefit from product: Tommy TERPENE+ TM as it will increase carbohydrate availability resulting in accelerated uptake of vital minerals including P&K while providing a valuable food source for the beneficial microbe life within your chosen substrate. Tommy TERPENE+ TM can increase resin production within resinous ornamental and medicinal plant types without adding large amounts of NPK or interfering with existing nutrient programs, leaving you free to use it at any time the plant may need it. DILUTION: 0.3 - 0.7 ml per litre. START: Beginning of week 3 of your flowering phase. FINISH: 2 weeks from harvesting or displaying your favourite plants. USE on any and all leading substrates, systems or water, but for consistently outstanding results use with only Tommy Gun base nutrients. Premium Grade sensi Formulation GUNPOWDER PK Liquid. Premium Grade sensi Formulation TM Combat JUICE PK. Combat JUICE PK is a Premium Grade Formulation PK booster for use during the later stages of the plants flowering stage. 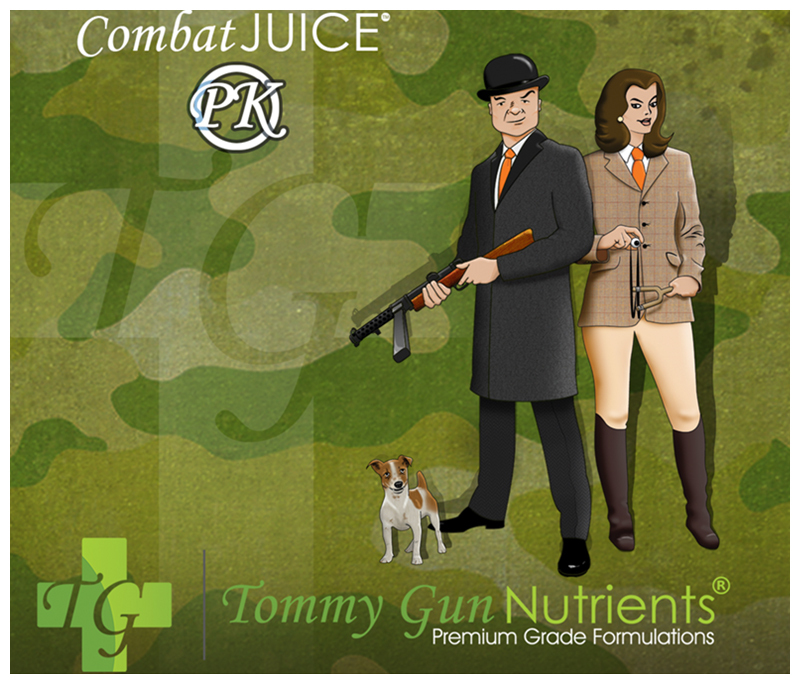 Combat JUICE PK can be used on any and all leading substrates, systems and water, but for consistently outstanding results use only with Tommy Gun base nutrients. Combat JUICE PK can add weight and density to your buds and flowers while increasing aesthetics, aroma and market value. With the correct and timed application of PK boosters such as GUNPOWDER PK, GUNPOWDER PK Liquid & Combat JUICE PK massive yields may be achieved, maximising your return on high yielding crops while increasing aesthetics, terpene aroma and market value. it will increase carbohydrate availability resulting in accelerated uptake of vital minerals including P&K while providing a valuable food source for the beneficial microbe life within your chosen substrate. Tommy TERPENE+ can increase resin production within resinous ornamental and medicinal plant types without adding large amounts of NPK or interfering with existing nutrient programs, leaving you free to use it at any time the plant may need it. DILUTION: 1.5 ml per litre. Use Combat JUICE PK week 5 of the bloom phase on top of your preferred base nutrient for increased growth. When used in conjunction with the correct and timed application of GUNPOWDER PK in weeks 1,6,7 and 8 massive yields may be achieved maximising your return on high yielding consumer crops and ornamental competition plants while increasing aroma, colour and market value. Alternatively use Combat JUICE PK on top of your prefered base nutrient for increased growth for one week only, 3 weeks from harvesting or displaying your favourite plants. Combat JUICE PK can be used on any and all leading substrates, systems or water, but for consistently outstanding performing crops use only with Tommy Gun base nutrients. Premium Grade Formulations TM Gun DOWN ACID pH Water Conditioner. 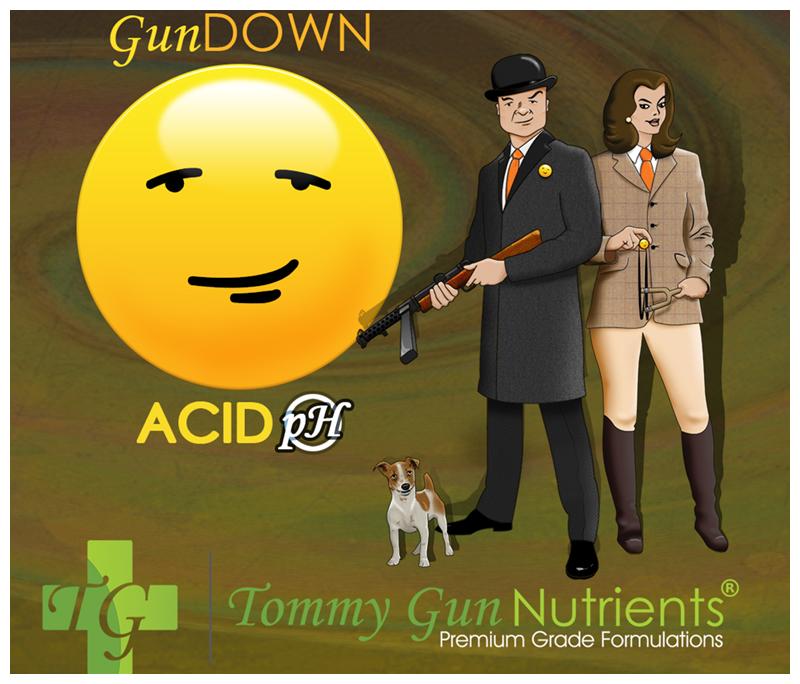 Gun DOWN ACID pH​​ Water Conditioner is a highly concentrated Phosphoric acid for use with any and all leading branded mineral solutions, systems and plants to control your pH & condition your water, but for consistently outstanding performance use only with Tommy Gun base nutrients. The pH of your nutrient solution is very important when growing in hydroponic systems and also when growing in coco coir substrates or peat based soils. UK water is better when treated with Gun DOWN ACID pH Water Conditioner before you add your base nutrient of choice to ensure that your nutrients are available when required by the plants. Gun DOWN ACID pH Water Conditioner is suitable for mineral solutions. Use a pH meter or colour match kit to determine the pH value of your solution. Add small amounts of Gun DOWN ACID pH Water Conditioner to the solution. Mix thoroughly, re-test and repeat as necessary. Gun DOWN ACID pH works best when pre-diluted before adding to the mixture. Wear Personal Protective Equipment (PPE)when handling. In contact with eyes rinse immediately with plenty of water and seek medical advice. 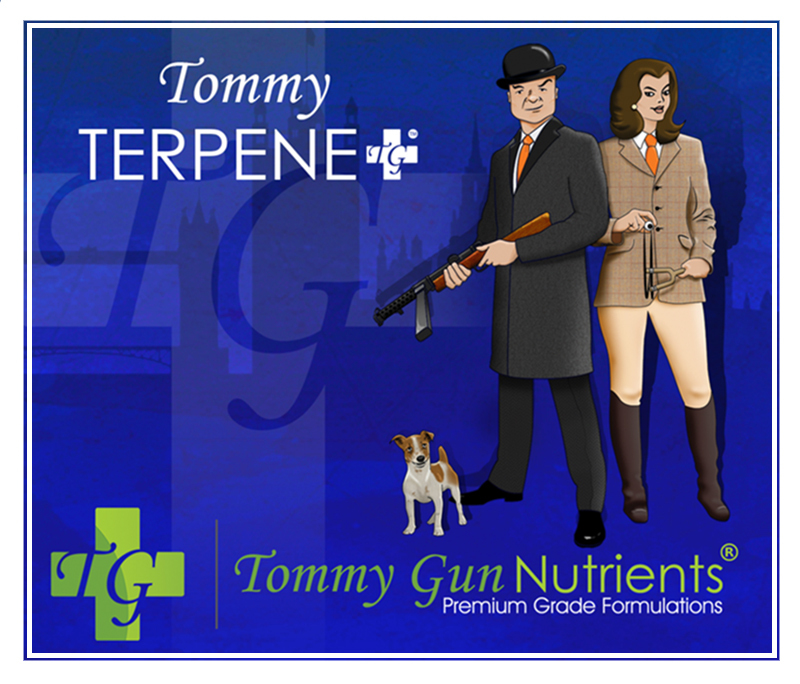 Tommy TERPENE+ is a liquid carbohydrate and essential oil producer for use throughout the plants entire life cycle and is compatible with all leading nutrient brands, substrates, systems and water, but for consistently outstanding results use only with Tommy Gun base nutrients. Heavy yielding colourful aromatic consumer crops and competition ornamental plants can greatly benefit from using Tommy TERPENE+ as it will create a food source for beneficial bacteria and help your plant use existing nutrients within the substrate or water system. Using Tommy TERPENE+ during the vegetative, Pre flowering stage of a plants life can create a shorter more compact plant. Using Tommy TERPENE+ during the flowering, fruiting stage of a plants life will increase available carbohydrates resulting in accelerated nutrient uptake including fruit and flower growth. Tommy TERPENE+ can also be used during the clearing / flushing of your favourite plants before showing or harvesting to increase aesthetics, yield, colour, aroma and taste. DILUTION: 1 ml per litre. Tommy TERPENE + can be used on any and all leading substrates, systems and water, but for consistently outstanding results use only with Tommy Gun base nutrients. Tommy TERPENE + can be used as a stand alone carbohydrate booster or alongside any leading nutrient brand to increase the terpene profile within your chosen plant. USE: During vegetation stages or on veg crops to enhance your chosen substrate bacteria and enhance rhizophere micro life within water systems. This can also create a shorter more robust plant with bigger roots, enhanced colours and terpene profiles. USE: During flowering, to enhance PK absorption and increase overall size, taste and aesthetics in competition ornamental plants and in heavy yielding consumer crops. 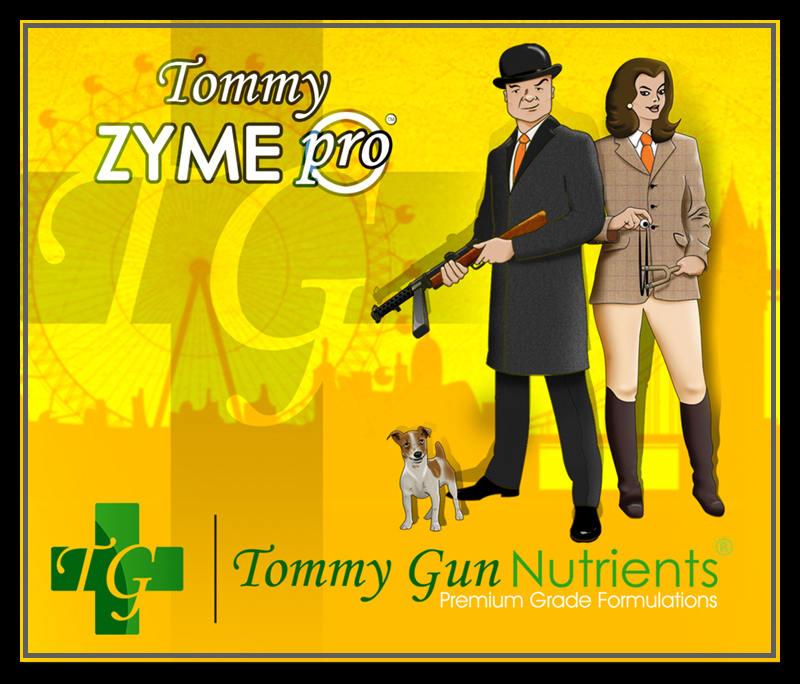 Tommy ZYME Pro is a Premium Grade sensi Formulation highly concentrated powerful enzyme formula for use on any and all leading substrates, systems, water or plants, but for consistently outstanding results use only with Tommy Gun base nutrients. Use on any and all leading substrates, systems, water or plants, but for consistently outstanding results use only with Tommy Gun base nutrients. Can be used as a stand alone product or with nutrients & additives. CAN BE used with HYDROGEN PEROXIDE in water systems. 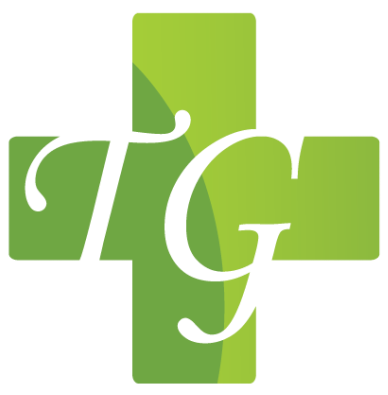 We have been using & improving our advanced plant fertiliser formulas & plant strains on the plants you love and the water you use until we were 100% happy with the results achieved on different crops, strains and substrates before finally letting you in on our secret...Premium Grade Formulations Tommy Gun Nutrients.